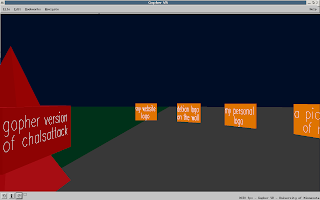 Here is a screenshot of my gopher site as seen using 3D client gopherVR. I hope you like it. SDF (Super Dimension Fortress) is such an amazing discovery that I just can't seem to put into words how excited I am about it. Is it a bit geekish? Very likely, that's why I love it even more. I became an ARPA member from the very beginning. After a 30 day period I can become a MetaARPA. Some of you may be wondering (as I did): Gopher? port 70? 1. Gopher is easy and fun!!! -You can find help on #gopherproject on Freenode. The first text browser I used with linux was w3m, then I moved to lynx and finally I discovered elinks (enhanced links). All three are great web browsers but elinks surely beats them all because you can do with it almost everything you do with a graphical browser, except obviously watching images or videos. With elinks you can access your online accounts, you can open and close tabs, bookmark pages, review browsing history and in short you can browse the web as usual but without images which allows you to load pages faster. And after all if you are like me more interested in the matter than in the art you'll definitely give elinks a try. It's great. I have been using it for a while now and I'm still impressed. Besides even though there is a bunch of keystrokes to learn you can do most things using your mouse, so there is no real difference with any other browser. But as all command line programs it's the keyboard that counts. By the way, you can see an instance of elinks if you click on the screenshots tag cloud on the right. Hope you like it. This weekend I have written a bunch of blog posts. (5? or more) but I didn't upload any screenshot so here is one. The posts dealt with several utilities I use on a daily basis (bluetile, gnome, irssi, elinks, ssh...) So I have taken a screenshot with several of those programs. There will probably be some more posts next week and I'll try to summarize them all in one or several screenshots. I hope you like them. In this screenshot you can see three windows tiled using bluetile; there's bluetile's bar on the left. 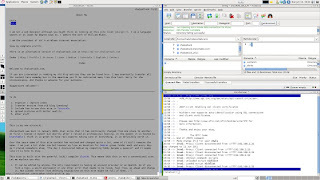 One of the windows shows my homepage as rendered by a command line browser named elinks. Another one my favourite ftp, sftp client filezilla. And last but not least irssi. In fact I've got irssi proxy running on that window. I connect to it using any other client like X-chat. Awesome isn't it? Irssi is probably the best irc client there is out there. According to their website, irssi is 'The client of the future'. Being a text mode irc client, which does not seem to be very fashionable nowadays when most people use graphical desktops, this is true for several reasons. One of them is because you can run it 24/7 in a server without a graphical environment and secondly because of its proxy module. It is difficult to explain the huge advantages of this in a short sentence. But let me try: If you use irssi proxy you'll be able to connect to it from any other computer across the internet and using any other client or clients. Let's say for instance: X-chat. All this keeping your nick because what you are actually doing is sharing one connection using one or several clients at the same time. You can close your clients connected to the proxy but your irc session will continue as long as your first irssi client and proxy are on. The first thing that may come to your mind may be that you can access your irssi client running on screen and using ssh. Yes, you sure can. But we are dicussing here the advantages of using irssi proxy. You can still have it running with screen as it does not affect how the proxy works. Let's get down to it. In order to use irssi proxy you have to compile it with the --with-proxy option. You can read the documentation for more details. 3.- /set irssiproxy_ports < ports.you.want.the.proxy.to.listen.to > It works < network >=< port > I use oftc so I wrote oftc=6667. You can specify as many as you want, or need. Now the proxy is listening to connections on port 6667. Since it is a proxy you can connect as many clients as you want. 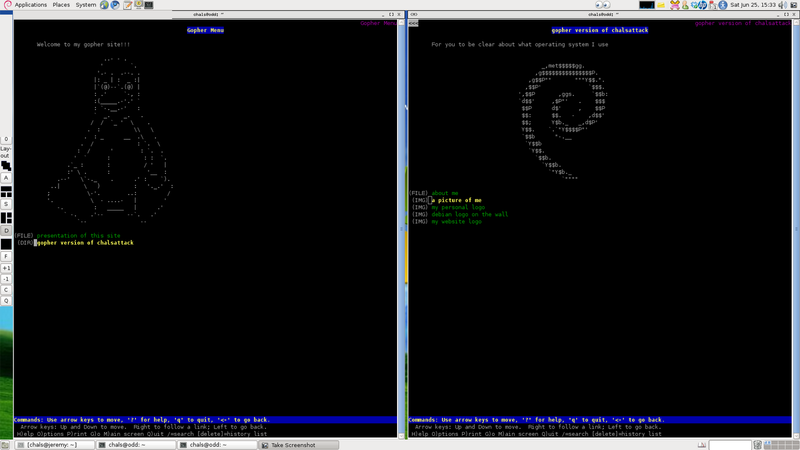 They will all share the same irc session actually running on your original irssi client with the same nick. You could be on a machine with xchat in another one with gnome-xchat. All your conversations from different clients would be one on the server. And your nick would be the same. The only problem is that on the clients connected to the proxy you will not be able to read the backlog. You can read it anyway connecting to your original irssi client, the one you have activated the proxy from. Now you're done. Enjoy your chat, and /part if you want to, but there is not the need to /quit anymore using irssi proxy!!! Irssi is possibly the best irc client there is out there. It can be installed and used on a variety of operating systems. Even legacy ones!!! It is a command line irc client, now you're thinking that nowadays it has no future at all. On the contrary!!! That is precisely what makes it outstanding. Let me explain you how I discovered irssi. In order to do that I have to tell you all my irc story. Do not worry it's really short. One or two lines at most. I was not an irc fan untill recently. -My first irc client was a web-based one. I used it to connect to #kanotix back in ~2006 to ask the team a question and (I imagine) congratulate them. -My second irc client was X-chat. A great and widely used client (There is no doubt about it) I had used it occasionally before. 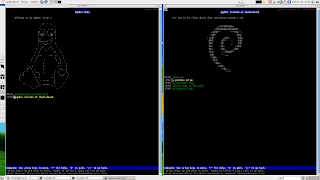 I first used it seriously in 2011 to connect to #debian-live (You will surely notice the 5 year leap. I told you before, I was not an irc frequent user. The great thing about command line clients is that you can install them on a web server and keep them connected to your favourite channels 24/7. Does that mean that you chat all day and all night long? No way. It means that by keeping your client up and running you can read the backlog and keep track of what's happening in the channel while you're out there walking the dog or sleeping. On a channel there are people from all time zones. This means that while you sleep other people arrive home from work or when other people wake up you are on your lunch break. Now it's easy to understand this 24/7 thing. ... but once you get used to it it's not difficult at all. I think this is enough for an introduction to irssi. If you want more information you can visit http://www.irssi.org/ or wait for my next installment in the irssi series. -You copy the image and create the partitions by hand which is great to learn how to do it but you would like to make it all automatically using a script. -This script is very simple and written and tested for personal use at home. -No magic regexes used, just a logical sequence of variables and commands. -You really must know what you're doing if you decide to try this script. Use at your own risk. The commands in the following script are very useful but if misused they can cause a filesystem mayhem and even destroy important data. ## This script assumes you know what you're doing!!! Using dd, parted and mkfs can end up in data loss!!! This painting was done using the original debian logo from http://www.debian.org/logos/ and posterized using software (Debian ships several programs to do that: apt-cache search poster ). We created the poster, cut it out and painted it using graffity spray. The size is approximately 2 square meters or 6 feet. A picture's worth a million words.